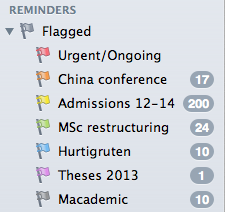 I have recently started to use differently colored flags in Mail app. My past advice on email reflecting the GTD wisdom and the Inbox Zero principle was that an email message is either something which can be dealt with in less than 2 minutes, is a calendar reminder (to be recorded in BusyCal), an action (to be clipped to OmniFocus), or a reference item (to be stored in your reference organizing system). In any case, after being classified in one of these categories each message should be removed from the Inbox to the archive where it can be retrieved, if needed, through the excellent search function in Mail 3.0. This advice stands good and true. However, I noticed that I often instinctively want to keep a bunch of ‘hot’ messages related to a complex ongoing project next to each other. That’s where message flags in Mail 3.0 help a lot. I am often involved in projects entailing extensive but short-lived email discussions with many people. Examples include university admissions where hundreds of candidates send their materials or respond to offers or discussions of a publication with dozens of colleagues. Most of these messages do not contain action items or are not long-term reference but I would nevertheless like to keep them very quickly retrievable to recall the discussion trail at any time. What I find very useful is to mark these messages with differently colored flags in Mail. As soon as at least one message is flagged with a particular color Mail organizes a folder for this color and you can give such a folder/color a specific name. I do not run more than 7 ‘hot’ projects at any time. After some weeks they usually ‘cool down’ (i.e. they are completed or at least the intensity of emails recedes). At this point I assign a MailTags project (which can be synced with an OmniFocus project) to all messages flagged with the project color and remove the flags (I will need this color for the next ‘hot’ project). If I ever want to see all these messages again in the future I will search for that keyword. This method is faster than dragging the messages to a folder or tagging them as they come (and then setting a smart folder based on the tags). I do not recommend using the colored flags on low intensity/long duration projects. If you want to keep messages related to such projects organized the best method is to assign a MailTags keyword or project or move them to a designated folder. To do it faster, set up a MailActOn rule. To access your folder (or SmartFolder) easier simply drag it to Mail’s Favorites Bar. You can then switch to that folder by pressing ⌘-N where N is the number of that folder on the Favorites Bar. 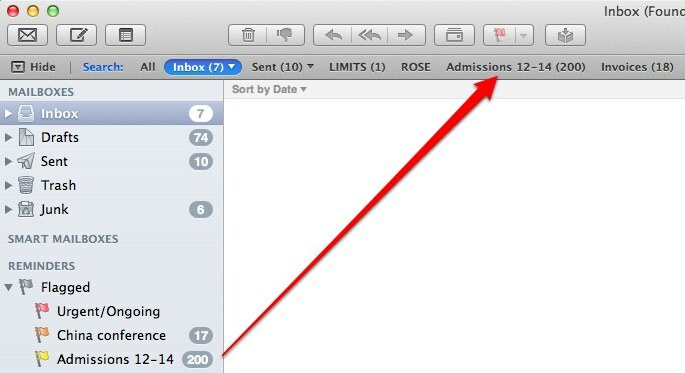 For example, ⌘–3 takes me to the LIMITS folder and ⌘-4 – to the ROSE folder (see below). You can even do it for folders based on colored flags. Last piece of advice. Mail labels the smart folders based on colored flags “Reminders”. But do not put anything reminding you of future actions there. Use OmniFocus or other software designed specifically for task management. This entry was posted in Email, Projects, Tags and folders and tagged BusyCal. Bookmark the permalink. Aleh, recently discovered your blog and enjoy it very much. I noticed in one post that you said you’d be testing out Daylite. I was wondering how that went, since I’m now hoping Daylite could serve as alternative to my existing OF + a list of mail management tools that I was about to invest in. Did you find that Daylite could do it all? I have indeed bought Daylite and planning to report on how it works for an academic.